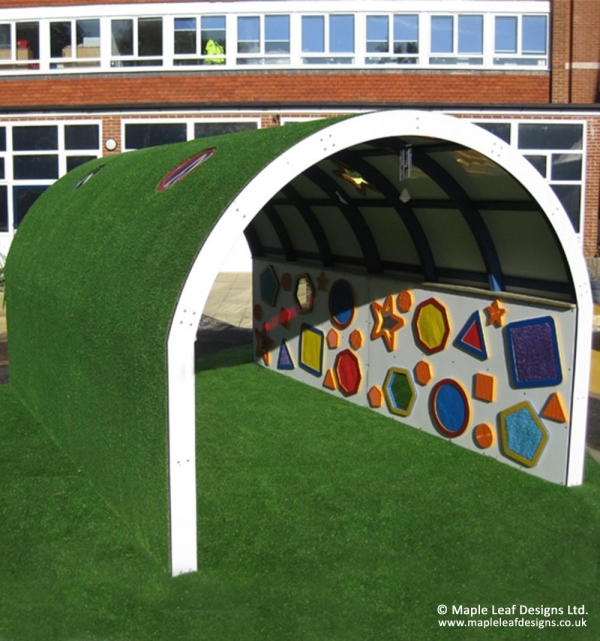 Inclusive Sensory Tunnel - Maple Leaf Designs Ltd.
For children with special educational needs, sensory play can be a vital part of their development, and as such our Inclusive Sensory Tunnel should be a valuable addition to any play area wishing to deliver those sensory experiences. The tunnel is manufactured to allow two-way access with its extra width, and its 2.4m high roof is designed to prevent a claustrophobic feel while passing through without detracting from the tunnel experience. The roof of the Inclusive Sensory Tunnel has multicoloured porthole windows of different shapes and sizes for visual stimulation and is fitted with wind chimes at either end. Along the inside are a multitude of shapes of varying colour and size, some with engravings and some coated with tactile materials, and the rest fitted with mirrors. On the opposite side music panels are fitted to deliver sound and resonance, along with a built-in talk tube speaker system that spans the length of the tunnel, encouraging interaction with a scientific element. Finally one of the outer sides is fitted with two giant mirrors spanning the full length of the tunnel for visual interaction. Talk tubes for resonance sensory fun.